Shirdi Sai Devotee Neha Sood From India Says: Sai Ram all devotees. I feel really blessed to be part of this Mahaparayan. I am from MP-39 group. I really appreciate and thank Pooja ji, Neha ji, Soumya ji, Hetal ji, Shireesha ji, Laveena ji for organising this Mahaparayan and they are really blessed and are chosen by Baba as His instruments to do all this work. I used to experience many miracles of Baba in day to day life but here is one of the wonderful experience that I would like to share with you all. I am not a good writer but with Baba’s blessings I am writing this leela which happened during Mahaparayan. Shirdi Sai Devotee Vijaya Lella From India Says: Om Sai Ram! Dear all, I am one of the members in Blue house of Mahaparayan. 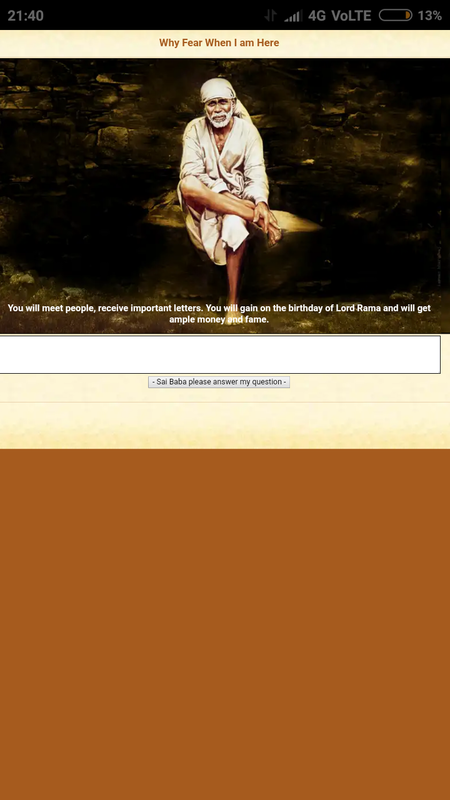 It has been long since I wished to post regarding the long awaited blessing that we received from the merciful Baba. We all have been with Baba for around 20 years and been under the umbrella of His protection in smaller and bigger things in our lives. My daughter has been given in marriage to my brother’s son who stays in USA, which we all came to know that it was the plan of Baba. After a year, my daughter conceived and before all of us synced into the joy of the new arrival, the pregnancy got aborted in the second month, leaving all of us into a deep sorrow. We stay in India and they stay in US and it became very difficult to console them and accidentally it happened on their wedding anniversary when all the friends and relatives wishing and complimenting them for the arrival of the baby and anniversary over telephones. It was so pathetic that they had to share the sad news. It took some time for us to realize that may be it was for our good only. After a few months she conceived again and this time too it got aborted. This was happening every time and the medical reports showed no negative biological disorders and no report could give a reason for these happenings. "I shall draw out my devotees from the jaws of death." I have lot of instances where I have been caused and guided by Baba.There was this day in 2016, Jan 31st while I was about to go to bed. I had a brain haemorrhage and was taken to the emergency. I was taken for an angio cerebral CT scan where I was not supposed to move and I was very uncomfortable as my hair was under my back and was hurting. I was in lot of pain. The only thing I could do was chant Baba's name. Then suddenly I realized something and felt that I was taken into someone's lap and hair was moved away towards my head and then I felt very comfortable. Shirdi Sai Devotee Monica Chandra from India says: Om Sai Ram I am blessed as Baba gave me an opportunity to be a part of Mahaparayan group. I would like to share my experience during Mahaparayan reading. I have already shared one experience of my 1st Shirdi trip which happened in January 2018 during Shatabdhi year. Today sharing with you all my 2nd experience. I am a girl in my 30's. My parents were looking for a match for me from past 3 years but nothing was working out. I being a part of Mahaparayan group prayed to Baba for my marriage and fortunately with Baba's blessings on 20th Oct 2018 day after Dusshera I got engaged. It's all Baba's blessings and love. Shirdi Sai Devotee Niranjan R from Oman says : Sai Ram! I am Niranjan from Oman, thanks everyone who are all maintaining this good work of sharing our experiences. Coming to my experience, I had applied for NRI Bank account in the month of October 2018 and everyone was telling that their experience of NRI account opening was very difficult and that some people had to wait for more than 2 months. Also they were rejected and all because of many issues like sign mismatch and all those things, as our signed applications would go to India through post to the concerned bank where we wished to open bank account. So if any small mistake then they would send it back again. It was kind of long procedure here and so I was little tensed. Later I was just neglected. Anonymous Shirdi Sai Devotee from India says : Om Sairam to all. I am one of the member of Group MP-326. I had dropped my CV at many places for a good job. One day I was at my home for Dusshera vacation. One school had called me for an interview. They asked me come to their place within two to three hours. I had no money to travel and attend the interview. But I asked Sai if I should go and attend the interview through chits. Sai replied ‘Yes’ that is I must go. Then I had started my journey which was not sufficient but I sat in the bus. I was thinking what would I do when the conductor would ask for money? I was saying and praying Sai save me in my mind. Shirdi Sai Devotee Susama from India says : I am Susama, one of the member of Mahaparayan group number Sai Pallavi MP- 326, having Roll-9 and member of red house. I had given many government exam but unfortunately did not pass in any exam. But this Monday I had appeared one written exam which was reached after 2 years of the actual date. But after joining Mahaparayan group it had come. I was not interested to attend but my father forced me to attend. Shirdi Sai Devotee Ruchika from India says : Sai Ram to all my Sai Bandhus, My name is Ruchika from India. I have completely surrendered to our Shree Sai Baba and He always takes care of us. I was not aware about all His leelas and had never been at temple too. Many, many years ago my neighbour gave a small book from Shirdi as during that phase my mind was not stable. So she suggested me to read that for mental peace. I did not but who can run from Baba if He Himself want you at His lotus feet. Later few years back my sister introduced as she was visiting Sai temple on every Thursdays and fasting as well. Something so bad happened in my life and I visited temple and asked the Pujari for Sai Satcharitra. Pujariji just touched the book to the Baba’s lotus feet and gave me as if He was waiting for me to come. I was surprised. Then I started reading and now years later my mind is so calm as I have surrendered myself to Baba’s lotus feet completely. I am still reading on every Thursday. Shirdi Sai Anonymous Devotee from India says: Hi Om Sai Ram! Namaste Om Ganesha Namaha The experience which I'm writing belongs to the Lord of universe Shri Sachidanand Satguru Sainath Maharaj. In 2017 November I had been to Shirdi. That night I could not sleep as I was getting a dream that someone was harming my sister and mother in Bangalore. I woke up and went to kakad aarathi. I don't know why I was crying and I'm a very strong person. But I didn't know why I was crying in samadhi mandir. Here in Bangalore same night my relative try to poison the water tank to harm my family. They usually drink water after getting up but that day they did not do that day. They went directly to wash their mouth and their mouth started to burn. Immediately they got the water checked and it was revealed that it was poisoned and how Baba saved my family. The time when they went to wash their mouth was the same when I was in kakad aarathi in front of Baba in Shirdi. Shirdi Sai Anonymous Devotee from India says: Om Sai Ram everyone. I am from MP-367 Varsha Group. First of all I would like to thank our dearest Baba for giving us the opportunity for doing Mahaparayan and making our life happy. Also a big thanks to all those who are making this parayan successful. Varshaji thank you so much for being there whenever I needed you, Baba sent you as a blessing in my life. Please do not disclose my name. My experience goes like this: One day I was so stressed and while browsing I came to know about Mahaparayan and I registered myself. I was not getting the desired job for the last 3 years and I was so worried. I used to cry in front of Baba. I used to think whole day and night and was in a sort of depressing mode. One day in Q&A site Baba said that I would have a big gain on Ram Navmi. During the third week of my Mahaparayan i.e., on Ram Navami I got a job in a very big organization and that too on a very good package. My joy knew no bounds. I did nothing. Everything was planned by Baba, interview went so smooth and I got my desired job. Love You so much Baba. I also joined Tuesday chalisa group and I read Vishnu Sahastranam daily atleast 10 names daily. Whenever I ask for Baba’s presence He comes within seconds in any form. Shirdi Sai Anonymous Devotee from USA says : Om Sairam everyone I want to be anonymous. I am from USA and part of Mahaparayan USA group. I would like to share couple of experiences today; one as part of the Mahaparayan and one from 2010. First of all we would like to Thank Baba from the bottom of our heart. Don't know how we would have fared without You Baba. Thank you Poojaji and all other volunteers who have given everything in Baba's service. Shirdi Sai Baba devotee Richa Das from India says: Om Sai Ram. I am from MP-367 and a small devotee of Baba.I never thought that I could be a part of this Mahaparayan as I came in touch with Baba only a few months back. Before becoming a member I had ordered prasad and Udi from Shirdi online but almost a month had passed they didn't send it. I even requested Amitji from Shibpur Sai Mandir if he could tell me how to get Baba's Udi. Days passed with no reply. I thought maybe it was Baba's wish that I should not get any Udi. I even prayed to Baba that if You are with me You will definitely do something about it. Again I thought that I came to know Baba only for a few months why should He show me any miracles now. But the surprise was on its way. Shirdi Sai Baba’s Anonymous Devotee From UK says: Jai Sai Ram. I am part of the MP-85 UK NavLaxsh Mahaparayan group. I wish to thank Pooja ji and the team for their efforts in successfully running this noble task through which we have got immense blessings from Baba. I am sure we all have gone more closer to Baba through this Mahaparayan. I had promised that I will share this experience with all. A lot has happened ever since I have been part of this noble journey. Baba blessed me with a Shirdi trip during this period and furthermore He gave me a special gift when I returned to UK. After few months after I came back from Shirdi, I realised that I was pregnant and was really happy. My elder son too prayed to Baba in Shirdi that he should get a brother soon and I believed this was Baba's gift to me and my son that by His grace only all went well and I successfully delivered a baby boy in Oct 2018. I always prayed to Baba that the baby should come in October as it will be Baba's special Mahasamadhi month. 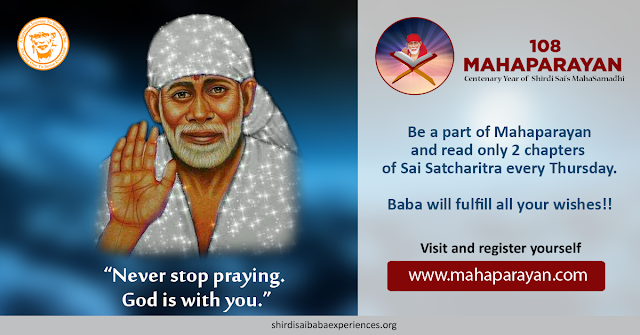 Shirdi Sai Devotee Gowri Oberoi from India says: Poojaji I will be happy if this experience be posted during this Navratri as it has a nice message for all. How Baba travelled with me in business class. Two days ago (8-10-2018) I was in flight returning from New York via London and before boarding flight from London, I prayed for Sai Appa to come with me in flight. In the boarding queue standing next to me, I saw a white male, a very old monk or sanyasi kind of person wearing orange and peach clothes like Baba. I was wondering if it was Baba. When I boarded and was about to sit on my seat, surprisingly I saw the same old Baba on the seat next to mine! There were seats facing each other in the airline and he was facing me and had a wrinkly pleasant and calm smile when I saw him. As I was settling in my seat keeping cabin baggage in the bin and adjusting belt etc., I saw that there were two headphones kept on my seat so I asked him if one was his and he said “No I have mine and you got lucky and got two!” I felt like it was Baba Himself and He was saying that I got lucky and I got two Darshans of Him and even got to travel sitting facing Him! Not to mention the flight was very comfortable with no turbulence and the service was also amazing by Baba’s grace. This is in continuation to my earlier experience of 18-10-2018 in which I had shared how Baba came and had my Khichdi prasadam and also arranged for me to have His darshan in the form of Padhukas and Kafni. Anonymous devotee of Shirdi Sai Baba from India says: Om Sai Ram to everyone. I am very happy to share my experience with you all which took place on my birthday. I am a student preparing for my entrance exam. 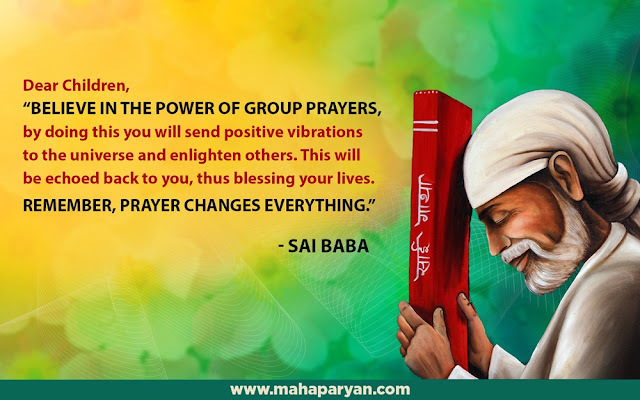 First of all I want to thank all members of Saiyug network who are doing selfless and beautiful services to Baba and spreading Baba's glories across the globe, it enhances divine energy multiple folds. I want to specially thank Hetal didi and Pooja Garg ji who are Baba's special graceful children. They are really doing fabulous work for Baba and the beauty of which is indescribable, thank you so much for giving me the opportunity to share my experience with you and here it goes. I enrolled in Mahaparayan group from 13th September, 2018 following my constant inner instincts that I should join Mahaparayan. I was knowing my schedule was such in a way that I won’t be able to read chapters for some Thursdays so I was hesitating but some inner force was constantly pulling me to join and so I took it at as Baba's wish and without thinking I joined. Coming to my main experience, my birthday was going to come and on my birthday I asked Sai Baba,"Sai what gift are You going to give me? It’s my birthday Sai." But nothing happened till evening and I was upset due to some of my personal reasons too. Then I went to Baba's temple in the evening. I sat there and was just looking at Baba's face and was very upset for my personal reasons and with Baba also. Then I came back home after sometime. I gave chocolates to my neighbor aunty because it was my birthday. Then she said "why chocolates?" I said," it’s my birthday” and she wished me. She was not knowing earlier that today was my birthday. As we share nice bond she wished me very nicely. She said "I have something for you, I got 1 book which is regarding Sai, I thought I will give it to you". I said "which book? Sai Satcharitra?" She said, "I don’t know exactly let me show you." 1. Baba blessed me with a job change. 2. Experience of HIM listening to my mind and wishes. 3. Doing Mahaparayan and reading of Nav Guruvar Vrat book. Baba, please forgive me for posting these experiences late on this page. I would like to share deeply connected experiences that I had with our beloved Baba. I have been working in the USA for some years. As Baba carved my path, I just blindly followed it. Total tenure on my work permit visa was getting closure to an end and wanted to shift to a bigger firm which could be suitable for my needs. I must tell you that, I had been searching for a job change for almost a year, while in a current job at an Indian MNC in the USA. Many things occurred and there was a time when I received an offer letter, but for some reason I couldn't join that company. I was so disappointed and frustrated as most of us would be, but as I knew in one corner of my mind that, Baba has some other best plan for me and He didn't want me to be in that place. I went through mixed emotions. Once I would feel that Baba would take care and sometime later I thought, He always wants to test and put me in pain. My restless mind did not understand why He was doing all this at that point in time. Later, all my questions were answered. Work permit visas had been going through a lot of scrutiny under new administration. That point in time was so not in favor that, many transfers were getting rejected or put under RFE(Request For Evidence) status. Baba saved me from all those sort of happenings. Now, I'm blessed with a job offer from one of the biggest firms in the US, even during this tough situation. One of my good friends referred and helped me a lot to prepare. (I have joined the company in May 2018). I thank Baba whole heartedly and continue to be at His feet as a dust particle. Please be with us always Baba and I am sure under Your light and ever flowing love, everything will go smoothly on joining the company. 2. Experience of HIM listening to my mind and wishes: I was driving to my friend's city by myself, which is an eight hour drive from my place in the USA. At one stretch of time, a lot of thoughts were flowing in my mind, such as my wish for job change, how is my life going to be, bride search, etc., whenever I used to think about something or ask a question to Baba, there was a truck with name - SAIA(A big truck company) crossed on the opposite lane of the freeway. What a blessing it is? I'm not sure how many trucks passed by me in total whenever I thought/asked something to Baba. I did not experience like that anytime on a freeway. Why should those exactly pass whenever I thought of something? After one point those stopped crossing me. So, me being ignorant and wanted to check Baba's pervasiveness, I told, if this is the case, can You please appear within next few moments? To my utter shock, I see only a truck crossing me with name - 'SAI'A again. My tears of joy rolled down my cheeks and knew no bound. I can't ever explain the feeling of my heart melting and wanting. After sometime, I felt as hungry as I was continuously driving for 5 hours non-stop. I passed through a few towns and couldn't find a good restaurant. Again, I told Baba that I was hungry and please find me a place. You know what; again a truck with name of SAIA appeared the very next moment, showing that He even listened to me this. That was the last truck appeared with that name during that journey. Within next few minutes I found a restaurant and had my late lunch. I thanked Baba for everything. Last year, there were messages floating around in one of the whatsapp group about Mahaparayan. Initially, I thought of joining and after, was thinking whether I would be able to keep up with the commitment for a year or not. Days past and was nearing the end date of registration. Long story short, I reached out to the coordinator and mentioned about my interest of joining. She then reached out to global team for any vacancy. A few days past and there was no response. I thought, Baba didn't wanted me to be part of this, as I was in confusion previously. It was the day before the closing of registration and to my surprise, I was reached out by the coordinator and she said that, she could accommodate me as one of the devotees had a personal reason to leave the group. I narrated my story to her and she echoed my thoughts saying - how blessed I was to be included in this great Mahaparayan, where in only 7500 devotees got the opportunity across the globe (During first season). Moreover, I wanted to be a part of one specific city group and Baba made me part of the exact same group. Now, I was given one more responsibility of captaining one of the houses in that group. I would like to also narrate a few instincts or direction that I got from Baba to read 'Nav Guruvar Vrat' twice in last year. I followed it and completed with His grace and blessings. All my wishes came true and except the last one, which I'm sure Baba would take care of it. There would be specific reasons why it didn't happen until now, maybe I would understand later. Thank You Baba for being with me, protecting me and blessing me always. I will be at Your lotus feet forever. Jai Sai Ram. How can Baba ignore true bhaav of love and devotion? He is ever ready to respond and help. First season had around 5000 seats which were extended to 7500 for so many devotees would be disheartened. Since now the team is growing and as per Baba’s guidance and support we now have to fill up around 5.5 lakhs of seats by this Dasehra. So get up, come forward and do offer your dakshina of two paise by contributing atleast 2 members and opting for some seva and further inspiring others to do the same. Mahaparayan is a blessing in Kaliyug. We do need many helping hands for this big project of Baba. Thank You Baba for everything. Love You Deva. Jai Jai Ho Sai. 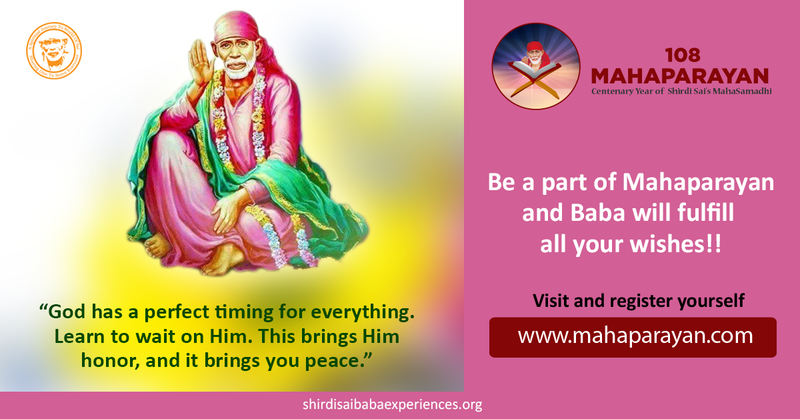 Shirdi Sai Devotee Jyothi from India says: Sai Ram, I want to share my experience with Baba, when I decided to start Maha parayanam on Oct 8th 2018. I had severe eye infection and blurred vision before that day. I thought how will I read my parayanam with these eyes. That night (Wednesday night) Baba came in my dream and cleaned my eyes with water. Next day my eyes were very clear and I completed my chapters which Baba alloted me for reading. It was really amazing. Shirdi Sai Devotee Nirupama Sinha from India says: Namaskar to all Sai devotees. It was my deep desire to share my experience of participating in Mahaprayan and dedicating myself to the pious service of Sai Ram. I feel fortunate that my dream has come true. First fo all I would like to express my deep gratitude to Nipun ji who suggested me to join the Mahaprayan group around the same time one year ago. After I started reading Sai Sachitra every Thursday, I observed many changes happening in myself and giving a new meaning to my life. Besides realizing the essence of a purposeful life having dedicated to Sai, I also observed some of my pending works got accomplished with His grace. I understand all these happened in my life because I followed messages in the Sai Sachitra which guided me for my eternal happiness. With His grace we were able to buy a house, although initially it appeared very difficult. Shirdi Sai Devotee Uma Rao kalluri from India says: Sairam to all Sai Devotees. I am from Group Number 576, Yellow House, roll number 38. Wanted to share with you a true story which happened in our house 2 days back after I started reading the Parayana. When I was assigned with the group, I was searching for my Parayan Book. We did search for the Telugu book so that I can start doing the Parayan. We have 3 cupboards which have all the books. We got down all the books and emptied the cupboards, I was also searching for It but it was not there. One day my husband who does walking everyday was walking with one different book of Baba when one gentleman came to him and asked him if he followed Sai Baba. When he said yes, he started sharing his experiences with him and the topic of this Parayanas came and my husband told him that we do not have the book with us as we recently moved to Hyderabad. In 15 minutes a new book of Baba was in my husband's hand as that gentleman gave a book to him. So without any efforts I was able to start reading the book. This was our first experience. Shirdi Sai Devotee Ankita Agarwal from India says: Sairam to all Sai Devotees. 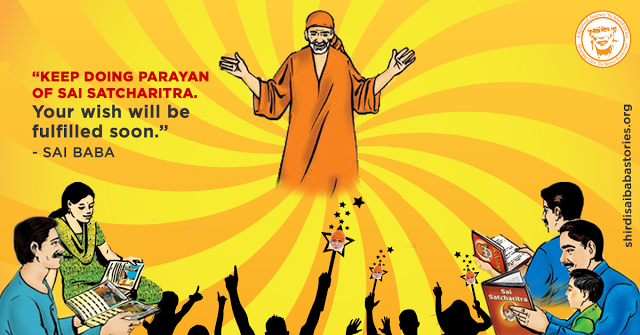 I am Ankita Agarwal, one of the members who has experienced the miracles of Shri Sai. It so happened in 2017 that I had completed my 12th from St.Mira’s College Pune and I passed with scoring 80%. I really had worked hard in std 12th and definitely scored very good and was very happy. But later when admissions started after scoring so well, still I couldn't get admission in the college I wanted to get in. I was literally depressed and unmotivated and was literally going to take a year drop but I decided to do external and not waste my time. Tough days, but yes they do not last and in my FY I was so much disturbed and distracted because of my family issues that I literally scored just 53% in year 2018. Shirdi Sai devotee Shyamala RY from India says: Om Sai Ram! Hello All, Om Sai Ram. This is Shyamala RY from Bangalore, I am a devotee of Baba since my childhood and He has been my guide since time immemorial. Though I have been connected to Him as said, in a way my connection with Him was not so strong those days, like how it is today. It was early this year in 2018, that my chords with Baba got reconnected in a deepened sense. All the credits for strengthening my faith towards Baba goes to my beloved brother Manjunath RY. He went on sharing his own experiences in a great deal and though I had my own share of experiences too, the amount of spiritual experiences we talked together made me intensify my faith on Baba to a great extent. Shirdi Sai Devotee Parvati Devadiga from India says:. Om Sai Ram! Hello Sai Brothers and Sisters I am Parvati, from India, a small devotee of Baba. Without Baba I am nothing. Thank You Baba for always being with me and my family. Today I am here to share some miraculous experiences of Baba which I had promised Baba to share on Mahaparayan experience and devotees’ experience blog. So today I am sharing with all of you in short. Before that I want to say sorry to Baba for late posting. My mom had a pain in her head and giddiness when she used to sleep straight. This was almost one month. She was not able to sleep properly. When she used to sleep on one side she used to be ok but when she turned to straighten again then she used to feel giddy. So she was tired and worried a lot and me too. 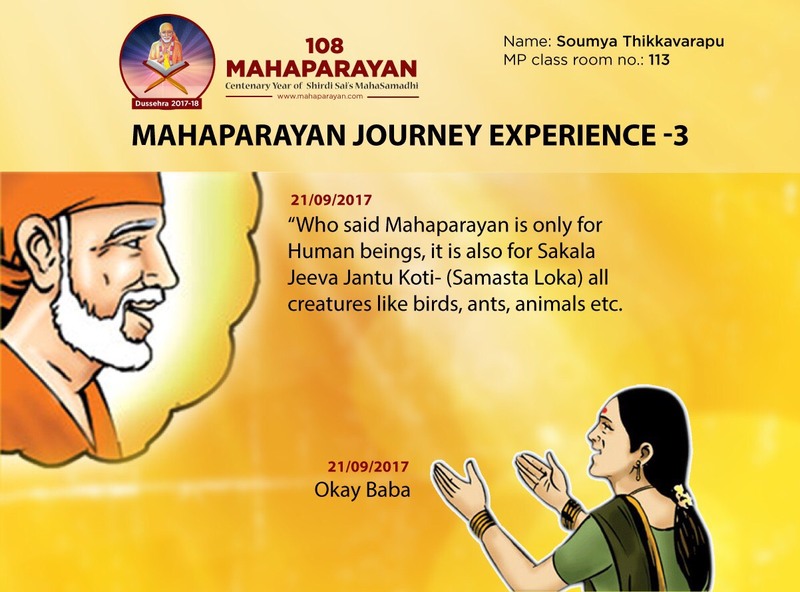 Then I prayed to Baba to make my mom alright, as a thanksgiving l promised to share this experience on the Mahaparayan experiences and devotees’ experiences blog. Then I took mom to the doctor. The doctor said that it was a case of vertigo and started treatment for a month and within one month my mom was alright and no more complaints of headache and giddiness were there. Thank You Baba for making this miracle. You always listen to me. Thank You for being with us always. Shirdi Sai Devotee Anuradha from India says : Hi, Madam, I am from MP-303 Vardhan Saritha Sai group Red house Roll No. 10 Hyderabad. Today I started Sai Mahaparayana. Before starting I prayed to Sai and said Baba Baba today I will make chapatis for You and You must come and eat them and show that You are always with me.